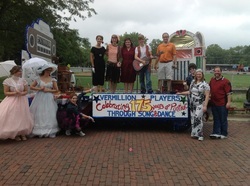 We were very excited to participate in this year's Thresherman's Parade after many years of not participating. We had some amazing talent build the float as well as amazing talent performing on the float. We felt very lucky and were extremely excited to win second place in the float decorating contest in the themed division! Thanks to everyone who waved, clapped, and cheered as we went by, your support is much appreciated!